England won by 6 wickets. That's all from us for today - thanks for your company. The series now moves to Dubai on Friday when England will look to wrap up a 3-1 win - while Pakistan bid to level it at 2-2. I hope you can join us then. Elsewhere on the BBC, I can point you towards our live coverage of tonight's England v France football friendly, which will be an emotional event following Friday's attacks in Paris. Goodbye from the cricket team. It looked a good toss to win this morning. But Pakistan were largely the architects of their own downfall - with three run-outs and several other batsmen unerringly skying the ball to the fielders on the leg-side boundary. 208 did not look enough at the interval, and Chris Woakes bowled well for his 4-40. It wasn't all that straightforward for England. Jason Roy and Joe Root fell cheaply, then Alex Hales and Eoin Morgan had to weather some hostile pace bowling from Mohammad Irfan and Wahab Riaz, and some wily spin from debutant Zafar Gohar. Ultimately, though, the best partnership of the match came when James Taylor and Jos Buttler came together - and they saw England home with nine overs to spare. Paul: What award do I win for following the game on the BBC Sport app seeming as there are so many on offer? England's Jos Buttler on his recent poor form, on Sky Sports: "It's frustrating. People keep coming up to me saying 'you'll get through it', but you just wish you never had to go through it. You do worry, as much as you try not to. It was a really big innings for me to try and give me some confidence. "At times during the summer, I potentially talked to too many people, and had too many ideas. I was too worried about how people were going to get me out, rather than how I was going to get runs. I've gone away from my strengths, possibly had too many ideas and got too muddled. "You almost do hope that you have that slice of luck, which I did on nought, to help me get a score." 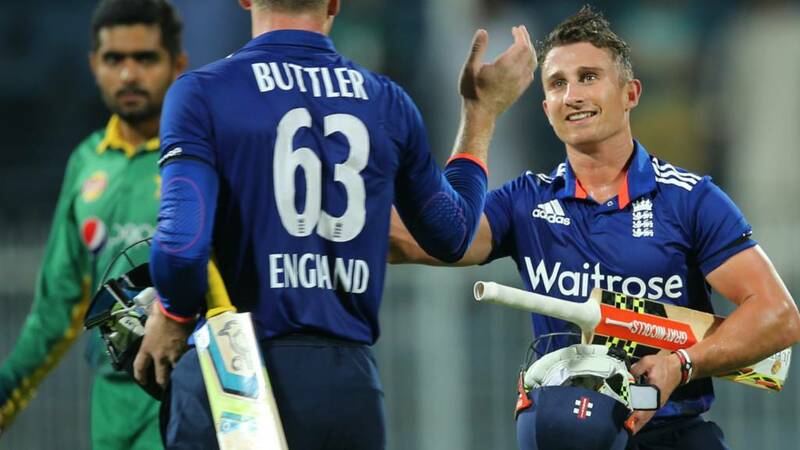 England wicketkeeper Jos Buttler on Sky Sports: "Fantastic partnership - James Taylor is a great guy to bat with. He's a man for all situations. It's nice to be a part of it. "The ball was turning on a sticky wicket, but the busier you could be, it put them back under pressure so you weren't sitting ducks. It was great to be not out at the end. "We thought their total was well under par. They were on for a good score and we dragged it back really well. Having watched the guys go about it, and watching the way 'Titch' [Taylor] plays, it put pressure back on them. "It's hugely satisfying for everyone, and the manner in which we did it, too. We didn't just sit there and try and crab our way out. We went out there and tried to put them back under pressure." More from captain Azhar Ali, on the three run-outs in the Pakistan innings: "We have to sort things out as it disturbs the whole batting performance." On debutant spinner Zafar Gohar, who took 2-54: "He put the English players under pressure. It's very heartening to see. Once we have a more settled team, we'll become a very good one-day side." Pakistan captain Azhar Ali: "We had a very good start, but in the middle we just lost it. We were going along really well for 270-280, but the run-outs and a few mistakes in the batting cost us the game. We really fought back in the second half, but one good partnership in the end got them over. We were 40-50 runs short." Sports Retort: Jos Buttler you idiot. Roll your wrists, club a four to level the scores then hit another for your 50. Must be dropped. But that six came from the last ball of the 41st over - if Buttler had hit a four, Taylor would have needed to bat out a maiden with the scores level if Buttler was to get 50! More from England captain Eoin Morgan, who was struck on the neck, drawing blood, during his innings: "The neck's fine, thankfully my shoulder took much of the impact." England captain Eoin Morgan: "The performance was hugely satisfying, the pitch turned more than we expected it to do and the partnership between Taylor and Buttler was outstanding. Every role we've given James Taylor, he's excelled in - they didn't allow the Pakistan bowlers to bowl as they liked. Hopefully we can produce another performance and win the series." Man of the match James Taylor, who made 67 not out from 69 balls: "Morgy and Hales got us off to a good start - and me and Jos were able to take it home. Jos at the other end played an exceptional role. "The pitch was almost a little bit damper in the second innings, which allowed it to spin a bit more. We tried to sweep as much as possible and not let them settle." Why on earth is little Jim Taylor never mentioned in the Test opener debate? Perfect foil for Cook. "Jos Taylor" is awarded the "Smart Player of the Match", as first announced. Ramiz Raja corrects himself and adjusts it to Jos Buttler. Wahab Riaz gets the "Most Colourful Innings of the Match", Chris Woakes gets the "Outstanding Performance" cheque - and the man of the match is James Taylor. "For his crunchy batting," Ramiz announces. That must be a real Boost for him. "This is the spaceman's big moment - Ramiz has started the presentation ceremony." Alice Stainer: Hung on in the office to see out match. Reward = England win! Delighted that @josbuttler delivered final blow #confidence. "Some of the finest players of the game have been the same height as James Taylor. For me, it's him for man of the match." The presentation ceremony awaits. If you've been with us for the previous ODIs, there isn't just a man of the match award, there are several intriguingly-named awards. And the white-clad spaceman from the toss is back! Not sure what award he will be presenting. "Most Out Of This World performance"? "Another gutsy person we should mention is Eoin Morgan. He's come on as a captain, he's really led from the front onwards since the summer. He's done that so well, and today was excellent. He had to fend off an awkward phase, he got that nasty cut on his chin, but he settled in and led the team nicely." Stoney: The England batsmen showed some backbone when it was in the balance mid innings. The boys are becoming men. Taylor and Buttler are all smiles as they shake the hands of the Pakistan players and walk off before high-fiving and hugging their team-mates. Taylor finishes unbeaten on 67 from 69 balls, with Buttler on 49 from 50. I wonder if he had considered hitting a four, rather than six, to level the scores and give himself a chance of an ODI fifty? But it was the last ball of the over - and it's a team game, after all. "What a fantastic partnership. James Taylor has started to cement himself in this team. "It could have been a really awkward position when the ball was spinning everywhere, but you just feel that they've got that momentum - you can see the smiles on their faces." Jos Buttler gets England over the line as he blasts a six over cow corner to finish on 49 not out. Taylor shovels Iftikhar for a two over his shoulder as Irfan lurches round the boundary at fine leg. Six to win. Andy Cooper: Home in time for an #England win! Simple pleasures. Anwar doesn't have the pace to trouble England, as Buttler knocks a single to third man to bring up 200 for the visitors, and Taylor does the same thing. Eight needed, and Aggers has spotted some sinister-looking blue-clad security guards ready to guard the pitch. ("There would only be an invasion here if you had the best high jumpers in the world ready to vault the fence," he points out). Jack Ewins: James Taylor should have been a fixture for England for the last 18 months. Though that is hindsight of course. Captain Azhar Ali is rotating his bowlers, more in hope than expectation, as he recalls right-arm seamer Anwar Ali who hasn't bowled since the fourth over. But he's bowling too short, giving up easy singles to the England pair who are picking them off as if they're swatting flies. 10 needed from 63 balls. "There's a dejected, defeated look about Pakistan now. They know their number's up." Jos Buttler is making sure he's still there at the end, playing out the rest of Iftikhar's over with an assured calm. 13 needed from 66. David Melton: 50 for James Taylor, he's clearly having a "Lovely Day". He'll have a Smiling Face by the end too. And I thought that "Lovely Day" was Bill Withers? The fight appears to have gone out of Pakistan - they turn back to Iftikhar Ahmed, who bowled two unremarkable overs of off-spin earlier, as many of their fans are trooping towards the exits. Buttler and Taylor nudge a couple of singles to reduce the target to 13 off 69 balls. "It would be nice for Buttler to get a half century here. He didn't have the best game with the gloves, but I think we all want to see him fire. Sometimes I think it does you better in terms of confidence to have to grind out the runs." That's the century stand, from only 93 balls, as Taylor and Buttler take England to within three or four big shots of taking a 2-1 lead in the series. "Zafar made a bit of a Horlicks of that. He should have caught it, and it went down between his legs for four. He's a better cricketer than that." After all that build-up, young Gohar blots his copybook when Taylor sweeps at Malik, the ball sails to deep backward square leg and Gohar is caught in two minds - neither taking the catch nor cutting out the four. Jay: Taylor eats giants for breakfast. Pakistan are going for broke here, this is young Zafar Gohar's last over. Skipping in to bowl slow left-arm, moving between the umpire and the stumps, his over concedes four runs - so he finishes with 2-54 on his debut. Radio 4 LW listeners are whisked off for the Shipping Forecast. The Sharjah Forecast is an England win - 25 needed from 78 balls. "England have a look of some confidence about them, but the tempo of this game has been so hard to predict." With only 31 more needed, Buttler might have to get his skates on if he's to make 50 - he's on 32, with his partner in supreme form. But with the run of scores he's had, I'd wager Buttler would be happy just to be there at the end without losing his wicket. England up to 180 - a great score in darts, an even better score in cricket when it means you only need 29 more from 84 balls. "Nice dismissive way to get to your 50. He showed that intent - the field was up, and he went for it." James Taylor reaches his fifty from 51 deliveries, smacking the recalled Shoaib Malik for a flat, straight six which lands just on the rope. Well batted. "I enjoyed James Taylor's runs today almost as much as I enjoyed Ross Taylor's runs at the Waca against Australia. If ever there's a decent man in cricket, it's Ross Taylor. He always says hello to me!" Gohar spins down his ninth over, again Buttler and Taylor are carefully picking off singles before the latter comes within sniffing distance of a half-century when he straight-drives past his partner to move to 46 from 50 balls. England need 38 from 90 deliveries. "Irfan was quite venomous with the new ball, but I think the extra bounce he gets with the old ball actually helps the batsman." Irfan has had a change of ends, running in from the far end for the first time today, and Taylor takes one hand off the bat as he lofts the ball over the ring of off-side fielders and past long-off for four. There's then a comedy moment as the Notts man unleashes a cracking pull shot, it's half-stopped on the boundary by the tumbling Wahab Riaz but the ball trickles onto the rope. An expensive over leaves 45 needed from 96 balls. Greg Double: England in control now - time for Pakistan to Gohar or go home. Another lbw appeal as Taylor sweeps. Same result - Pakistan's lack of a review may come back to haunt them, having wasted it against Alex Hales for that caught behind. But Taylor can't get the rest of the over away - so it's just one from the over. "This kid Zafar Gohar has got something. They tried to get him in for Abu Dhabi - he was in the Emirates four days previously, had to go back to Pakistan and then couldn't get a visa to come back. Hence why Misbah-ul-Haq was fuming when Zafar couldn't get in on time." After just one over of Irfan, Pakistan turn back to young left-arm spinner Zafar Gohar who's so impressed the TMS crew today. But less impressive is a full toss which he serves up to Buttler, and the right-hander from Taunton guides it to square leg for one. Taylor hit on the pad, an appeal... nothing doing, it looked to be going down leg. Taylor dabs a single into the off side. Pakistan are trying to keep tight on the ones, but when you've got two men as speedy between the wickets as Taylor and Buttler, they can seemingly take singles at will. 57 from 108 is the target. Richard Parfitt: Pretty sure if you took Irfan's shirt off you'd see him sat on the shoulders of another bloke. The contest is rejoined as Wahab Riaz tries some chin music at Taylor, which be bravely hooks down to the lumbering figure of Irfan at fine leg for a single. Buttler threads a single to the cover sweeper to bring England to the landmark of 150 - that's 59 more needed from 111 balls. Football Fragmento: Everyone wants to see 7 foot 1 Irfan bowl at 5 foot 5 Taylor. The small lad versus the giant. "It's been an intriguing game. There's been some good cricket and some atrocious cricket. England looked to be really struggling when Morgan went, but they have rallied very well. At the moment they hold the better cards." The towering Irfan, going round the wicket in the manner of Wasim Akram, foxes Buttler with a slower-ball bouncer first up, but the England fifth-wicket pair help themselves to four singles with relative ease. With a required rate only just above three an over, that will do nicely. Time for the last drinks break of the day. Thanks, Tim. 65 needed from 120 balls - nowhere near as easy as it may look on paper. And this game has had so many twists and turns, I wouldn't dare call it from here. We're back in the land of the giants as the skipper's part-time leggies have been shelved in favour of the return of Mohammad Irfan. England need 65 off 120 balls. Just one run off Wahab's over, but it brings up the 50 partnership between Taylor and Buttler. Azhar has decided that pace from both ends is needed, and whilst the beanpole figure of Irfan comes on for Pakistan, the similarly-proportioned Mark Mitchener is taking over here. It's rarely mentioned, but James Taylor is rather short. But he's a very wristy player, and he and Buttler are nudging the ball about cleverly. Three off Azhar's over. Pakistan turning back to pace now, with Wahab coming in for Shoaib Malik. Shiv: Should really pay attention in this electronics lecture but scared of the upcoming collapse #inevitable. Taylor dances down the wicket, and launches Malik off his pads into the stands. He absolutely middled that. Next one is turned into the legside, and gets the customary round of applause from traditionalists who like to see a conservative shot after a six. Theo Bowyer: England showing their fragility to spin yet again... An opportunity for the middle order to wrestle back the initiative! "I thought Azhar had summoned Irfan to bowl, then had a change of heart and thought 'I'll have a bowl myself'." Buttler and Taylor take a watchful approach to Azhar's first over, nurdling the ball around for five, but that's enough with the required run rate well below four per over. Will the real Shahid Afridi please stand up? A fast-moving partnership of 31 off 25 between these two here. Buttler has motored along to 17 off 14 - he'll be feeling more confident than when he first went out and charged down the pitch when on nought. Captain Azhar Ali brings himself on to replace Gohar. "When I was giving Zafar Gohar his cap for his debut today, coach Waqar Younis took me aside and said, 'You've got to watch this lad'." "Poor old umpire Johan Cloete was hit on the back of the neck there. He's not had a great day, after those lbw decisions were overturned earlier." Vic Marks adds: "Sarfraz Ahmed, as he knows the lie of the land, has immediately run up to ask if the umpire's OK. He knows you have to stay on the umpire's side!" Buttler reverse sweeps two deliveries in the over with the ungainliness of a man swiping a spatula to try and get a lost coin from underneath a cupboard. But they were either side of two almost unplayable balls from Gohar. Meanwhile wicketkeeper Sarfraz nearly takes out umpire Cloete when returning the ball to the bowler. Ambitious tactic, that. "Jos Buttler almost yorked himself there. He's yet to score, and if ever there was someone feeling the pressure... Anxious times." Crikey, Jos Buttler looks out of form. He dances down the wicket to Shoaib, completely missing the ball. Thankfully for him, Sarfraz misses the stumping, with the ball bouncing off his sternum. Buttler eventually gets off the mark, and Taylor looks much more comfortable at the crease, despite Malik getting a lot of turn. The pitch seems to suddenly have more turn in it than a sat nav in Milton Keynes. Taylor scratchily edges Gohar to third man for four. Dispatches another to the boundary, where Shoaib Malik attempts to cut it out on the rope, but seems to injure himself doing so. Buttler faces just one in the over, which he plays and misses at outside off. "I like the young left-arm spinner Zafar Gohar - he's got temperament and character, and he batted well too. Proper spin from a very young bowler." "Eoin Morgan did not know where his off stump was. He was outside the leg stump but he was undone by a peach of a ball which spun sharply." Gohar isn't the only one to get turn out of this pitch! Morgan played for the straight one, it spun sharply and clipped his offstump. You'd have thought Morgan, on 35, would have played that better. He shouts some encouragement at Jos Buttler, the next man in. He may need it. "Gohar's temperamentally strong, he doesn't give the appearance that he's making his debut. He could be a good future all-round cricketer for Pakistan." Gohar gets an edge from Taylor, but it goes between slip and keeper, both diving across each other. He's getting a lot of turn out there. Gohar's only 20 years old. Twenty! "Zafar Gohar's having a great debut. He's getting a lot more grip and purchase off the surface, turning the ball away, and the slip fielder stayed very low. Hales has gutsed out a nice 30 but he's vulnerable outside off stump. James Taylor's a very good player of spin, but Gohar will be hoping to unsettle him early." Hales will be frustrated with that. Gohar floats one up full, Hales came forward and pushed at it, the inside edge carrying low to Rizwan at slip. Partnership of 60. Impressive celebration from Gohar, who's on 2-22 on debut (I challenge you not to read that with a Richie Benaud accent). Challenging passage of play for England's batsmen to negotiate here. Messrs Hales and Morgan do well to get four off Malik's over. Unspectacular but effective stuff from the batsmen. "A little moment of fortune there for Eoin Morgan." Zafar Gohar back into the attack. Big shout for lbw as one darts back into the pads of Morgan, but Pakistan's only review went in the previous over. Replays suggest that had the decision been reviewed, it would have been umpire's call. Plenty of turn out there for Gohar. Morgan gets a boundary with a reverse sweep again. Eventful over that from Malik. It included a switch-hit from Morgan to third man (or is that fine leg once his grip changes? ), an edge from Morgan that didn't carry to slip, and that review. England need to be careful here. Not enough proof that Hales edged that down leg side, and Pakistan lose their remaining review. Wahab keeps bursting in, all sinews and muscle. Four off the over for England, which is just fine for them. Wahab has a strange balding pattern going on. The whole hairline has receded back a few inches, bar a small island of hair in the middle that he's grown, Bobby Charlton-style, and combed over. But what covers the back and sides is thick and bountiful. Shoaib Malik, an unlikely destroyer in the Test series, comes into the attack. And he's so close to ending Eoin Morgan's stay at the crease, spinning one just past the batsman's edge and somehow evading the stumps. Morgan beaten all ends up. Time for drinks, and after that, the commentary of Tim Peach. James Boswell: Starting to have real confidence in this England batting line-up. 1-6 all have the experience and quality to win matches. A better over from Wahab - just a couple of singles from it. Hales and Morgan are stabilising England well here. "Very few wrist-spinners are as accurate as finger-spinners, unless you're Shane Warne. Technically, it's easier to bowl finger-spin." Hales hasn't been too fluent so far but he's beginning to look a bit more comfortable out there. He sweeps Iftikhar powerfully and beats the fielder at square leg for four. Errant again from Wahab, down the leg side and Morgan just helps it on its way towards the fine-leg boundary. No, he's fine. Morgan grounded his bat well. "I think he's comfortably home, but we're going to have a look. Direct hit from mid-on. Poor old umpire Cloete has lost some confidence, he was on a hat-trick of reviewed lbws earlier." Now then! A direct hit shatters the stumps - is Eoin Morgan in trouble? Iftikhar is into the attack with his part-time off-spin. It's a good first over, just one run off it. The full votes: McGrath 60%, Dennis Lillee 25%, Brett Lee 5%, Jeff Thomson 5%, Mitchell Johnson 2%, Ray Lindwall 1%, Fred "The Demon" Spofforth 1%, others 1%. Actually, if you watched Spofforth play (last Test 1887) and are able to use the internet, you have our admiration! Wahab Riaz has been excellent in both the Tests and the ODI series - can he keep up the pressure exerted by Irfan? Not to begin with - short from Wahab but not quite venomous enough and Morgan rolls his wrists on it and dispatches it to the boundary. Roy is rightly being given a good run in the team but I'd prefer his county colleague Steven Davies to open with Hales in ODIs. He had an amazing season this year and has improved since he last played for England. A much-needed maximum for England - Hales releases the pressure valve with a big slog-sweep off Zahar. Glorious timing, made a wonderful crack off the bat as it sailed into the sky. "One thing you can't argue with - it's terrific bowling at the moment." "It's a good spell by any standards by Irfan. He's been fast, he's been accurate, on target and he's picked up one wicket." This is top quality from Irfan. He gets Hales wafting outside off, then is a fraction away from brushing his gloves with a head-high snorter. A real examination for England's batsmen at the moment. "The ball went from his shoulder and went underneath the grille. He's got a cut, and they may want to look at the helmet too." Hales and Morgan exchange a few singles from the rest of the over. It looks like Morgan is going to need a bit of treatment here - that short ball from Irfan grazed his jaw after hitting the helmet and has opened up a bit of a gash. Down! England would have been really in the mire if Zafar had held on to this, but it was a tough chance. Full-blooded straight drive from Morgan, travelling at a race of knots, Zafar puts his hands up but the ball clunks him on the forearm. "Irfan's up for it, and there's Wahab Riaz to come. The ball didn't beat the bat very often when England are batting. The Force is with Irfan at the moment, and they've slipped the debutant on early and he's got a bonus wicket. We've got a game on here." Irfan is well up for this - he raps Eoin Morgan on the helmet, completely deceives Hales with an off-cutter, then signals his aggression by pointing at his eyes then back at Hales. Hales juts his bottom lip out in affected nonchalance. Feisty. Eoin Morgan has had his troubles with the short ball and he's in a bit of strife here. Short from Irfan, Morgan misses with the pull and the ball cannons in to his helmet. He's OK but he'll be shaken up - remember he had to retire hurt after Mitchell Starc clocked in the ODI series this summer. Irfan is giving it everything - bouncers, cutters, pointing at his eyes and then back at Hales. Hales juts out his bottom lip in an attempt to appear nonchalant. Paul Roberts: Rooooooty what have you done? Cap'n Morgan arrives on deck with the ship in need of steadying. He clips a single past mid-wicket to get under way. "That was a bit of a gift. Zafar Gohar hadn't had the best over and that was a genuine low full toss, but Root will be frustrated as he could have got that one down, or hit it in front of square. I don't think Zafar looks threatening, but England need to be careful here. Eoin Morgan needs to steady the ship alongside Alex Hales, who hasn't looked too comfortable yet." Oh Joseph! It's a poor dismissal from England's number three, but a dream start to Zafar Gohar's international bowling career. With his fifth ball in ODI cricket, he serves up a full toss which Root inexplicably sweeps straight down the throat of deep square leg. England wobbling. Joe Root has just reached 2,000 runs for England in all three formats (Test, ODI & T20I) in the calendar year 2015. The only more prolific England players on that list are Kevin Pietersen (2,120 in 2007) and Paul Collingwood (2,026 in 2007). But the all-time record belongs to Kumar Sangakkara, way out in front on 2,868 in the year 2014. Irfan is pumped up here. He bangs in an absolute snorter which raps Joe Root's glove as the young maestro tries to take evasive action. No catcher there though. Ooh, what a let-off that is for Alex Hales. It's almost identical to the Roy dismissal - Irfan round the wicket, squared up trying to work him to leg, loopy leading edge. This time the ball arcs tantalisingly back towards the bowler, but Irfan, whose left mitt is bigger than most, can't grab it. Remember today's #QSTeaser from ‏@QuestionofSport? Since Mitchell Johnson’s debut in '07, who are the six other Australians to have played over 50 Tests? And the answers... Michael Clarke, Brad Haddin, Mike Hussey, Ricky Ponting, Peter Siddle, Shane Watson. England, of course, have the luxury of a modest target, so Root and Hales can play themselves in somewhat at leisure here without having to look for the boundary. A single to backward point takes Root to 2,000 runs in all formats for the calendar year - the third to get there, after Steve Smith and Kane Williamson - and he concludes the over with a bruising pull for four. Neil Chamberlain: Pakistan gifted @ECB_cricket plenty of wickets, if we bat like professionals we should easily see this through. Joe Root is the new man, and England fans will now be well used to the reassuring sight of him striding to the crease early, ready to defuse a mini-crisis. He gets off the mark with a single to third man. "He got completely done there. Irfan has come round the wicket and angles it in bowling that fourth-stump line, and it caused Jason Roy to square up." A rather odd dismissal, but just what the doctor ordered for Pakistan. Irfan comes around the wicket, the ball appears to stick in the pitch a little, and Roy completely mistimes it, popping a simple catch off a leading edge. A guttural roar of delight from Irfan - Pakistan haven't given this one up. Anwar Ali opens the bowling from the other end. Irfan gets down rather gingerly, like an old man stooping to fetch his slippers from under the footstool, and thus fails to stop a Hales leg-side clip from going to the fine-leg boundary for four, Those are the only runs from a pretty tight over though. I think Keith Miller would have a thing or two to say about your "Greatest Australian Fast Bowler Poll". He could bat as well. Roy busily pushes a two wide of mid-off and knocks a single backward of square leg. Hales leaves his first ball outside off stump, knowing there are two predatory slips waiting for that trademark nick, but slashes the last ball of the over for a single to third man. Simon Essex: Good luck @MitchJohnson398, always took Barmy Army banter in good humour. Edgbaston2015 ball to @jbairstow21 best I've seen live. The giant left-arm paceman Mohammad Irfan takes the new ball as Jason Roy and Alex Hales open up for England - and the first ball of the innings is a "gimme" for Roy, full and wide outside off stump and Roy steers it for four through point. Umpires on their way. England chasing 209 to go "dormie" in the series - 2-1 up with one to play. "It's easy to field as well as England did when things are going well and wickets are falling. The true test is when things aren't going your way." "England looked pretty good in the field - they just need to be clinical now. If they do the simple things right it should be pretty straightfoward. It's true bounce and it's pretty flat." Mike Adamson: The picture of Vic Marks used to accompany his comment looks uncannily like Deadline Day's Jim White. Really throwing me off. "It's not a pitch where you can race to victory. England should win this - they are clearly the favourites. But we've seen enough not to take anything for granted." "I think seniors stuff works in golf and tennis, to an extent - I don't think retired, overweight cricketers chasing the ball to the boundary [works]... they've had their time. But a lot of Indian supporters turned out to see Sachin." TMS are now looking back at the recent three-match "All-Stars" series in which teams of retired players led by Shane Warne and Sachin Tendulkar locked horns in three American baseball stadiums. Tattz: Impressive end-of-innings bowling from Woakes there...after being smashed for a 6, he kept his nerve and his line really well. "It's been very good from England. The fielding has been outstanding and James Taylor's run-out out Azhar Ali turned the game. We ended up with three and it changed the whole complexion of the game." "His arm action is what changed for me. You always knew deep down he was a really good bowler. Credit is due for the way he came back and transformed his career. "That 2013-14 series was the quickest bowling I've ever faced. But it's the slingy action, a bit like Shoaib Akhtar, that made him so dangerous." Mitchell Johnson's wife, Jessica: "He's definitely got two sides to him. There's that soft, sweet side with his daughter. And then he's fiery, and can react quickly. He comes across in a certain way to some people. "I'm most proud of him how he came back from adversity. It was tough what we went through. I'm just really proud." If you can't listen live to the interval discussion on Mitchell Johnson, you can listen again later via the Test Match Special podcast. Andy Donley: When you take Younis Khan and Misbah-ul-Haq out of this Pakistan side, it looks rather brittle and leaderless. Hassan Shah: Embarrassing to say the least. Can honestly say we're the best in the world at collapses. Vote: Who is Australia's greatest fast bowler? Batsmen the world over can breathe a sigh of relief after Mitchell Johnson's retirement. But is he the best Australia fast bowler of all time? Vote now on the right-hand side of this page, or via the tab at the top if you're using a mobile or tablet. The vote closes at 15:00 GMT. TMS is looking back on the international career of Mitchell Johnson, after he announced his retirement today. You'll hear from the man himself, wife Jessica, former team-mate Ryan Harris, and ex-England batsman Jonathan Trott about what it's like to face him. "Typical Wahab Riaz. Whatever he does is good to watch. Sometimes he makes a complete fool of himself, but today his 33 was worth at least 50." Pakistan suffered an astonishing batting collapse as they slipped from 132-2 to 208 all out in the third one-day international against England in Sharjah. Three calamitous run-outs ensued, while four Pakistan batsmen holed out on the boundary. Captain Azhar Ali (36) and Mohammad Hafeez (45) gave the hosts a steady start before four wickets fell in six overs in mid-innings. Only some lusty late-order hitting by Wahab Riaz (33) pushed the score past 200. "It's quite a big difference between 185 and 208. They'll be slightly cheered in that Pakistan dressing room. England know they've done a good job, but not quite the perfect one, with the odd dropped catch at the end. "Nonetheless, they'd have taken a target of 209 when they set off." "A folorn swipe from the giant Irfan." Well, he tried. Unfortunately he misses the ball, and sees his off stump comprehensively poleaxed. Woakes finishes with four wickets for the second game in a row, and England have a very gettable target of 209. "He was so far back and it hit him on the full, I can understand why he was given out. Woakes is wide of the crease and is firing in yorkers, which is why they were going down legside"
"Really poor decision that. I'm not even sure if it would have hit the stumps if he hadn't edged it."